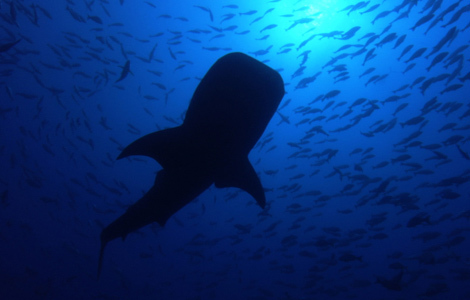 I was thrilled to learn that two of the migrations discussed in this series involve sharks. The first shark migration story appears in hour 3, “Feast or Famine”. 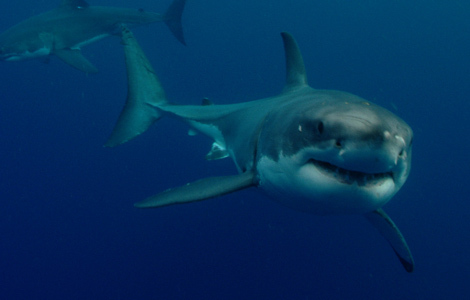 Many great white sharks travel over 3,000 miles to Guadalupe Island each year in search of food each year. Great Migrations does a good job of conveying how impressive and mysterious this behavior is, saying “somehow they always know where their prey are gathering from oceans away”. They are following the migratory path of another marine wanderer, the elephant seal. The episode has some amazing footage of a great white eating an elephant seal. I’m always nervous when the media portrays the impressive hunting behavior of these sharks, but National Geographic went out of their way to make people not fear great whites. Yes, some vaguely-ominous music plays as the shark eats the seal, but the exact same music is playing when a bald eagle eats a fish or when a little cardinalfish eats a jellyfish. The Great White Shark page on National Geographic’s website talks all about how these animals are a threatened species and how people shouldn’t be afraid of them, and the great white shark profile on the Great Migrations site is full of scientific information about them. As usual, National Geographic’s shark coverage promotes science and conservation instead of fear. It is worth noting that there is a great white migration more impressive than the Guadalupe trip- a single female tagged off the coast of South Africa was later found in Australia. For those of you who are geographically challenged, that’s over 12,000 miles. This was not discussed in the series, but is mentioned on the accompanying poster and was the focus of an entire National Geographic special called “Great White Odyssey”. The next shark migration, which appeared in hour 4 (Race to Survive) was that of a whale shark. Online, at least, Great Migrations notes that whale sharks are no threat to people and are in fact in trouble because of human actions. It was nice to see sharks on TV not in the context of shark attacks, but in the context of their incredible navigation abilities. Great Migrations also has other tales of ocean migrations. It told cool stories of the walrus, sperm whale, albatross, rockhopper penguin, and many more. There were also some stories about animals that live on land (if you’re into that sort of thing). This series premieres November 7th on the National Geographic channel. Be sure to check it out. Disclaimer: National Geographic sent me a DVD copy of the complete series, along with an associated coffee table book and poster. I would have liked it if they had covered the greatest of all migrations – the diurnal vertical migration of billions of tons of plankton from the depths to the surface every single night of the year. It may be less than 1000ft for most, but in number of body lengths its easily the equal of the reindeer or the wildebeest. And this from a shark guy! Nice coverage, have yet to see this, the predation footage is some of the best I have ever seen.